The folk over at The Ancient Near East Today, ASOR, newsletter have published a link to a new FREE SBL book Invention of the First–Century Synagogue by Lidia D. Matassa, SBL, 2018. It is a 289 page book in pdf format and is a fee Download HERE. I have not yet had time to read it but the Table of Contents indicates a treatment of the synagogues at Delos, Jericho, Masada, Herodium, and Gamla. Please see the comment below as to why other first century synagogues, such as those at Magdala and Umm el–’Umdan were not included. (Thank you to Gene Dahmes [below] for drawing this to my attention). Ancient Corinth: Site Guide (7th edition), 2018, multiple authors. This is the first official guidebook to the site of ancient Corinth published by the ASCSA in over 50 years, and it comes fully updated with the most current information, color photos, maps, and plans. It is an indispensable resource for the casual tourist or professional archaeologist new to the site. 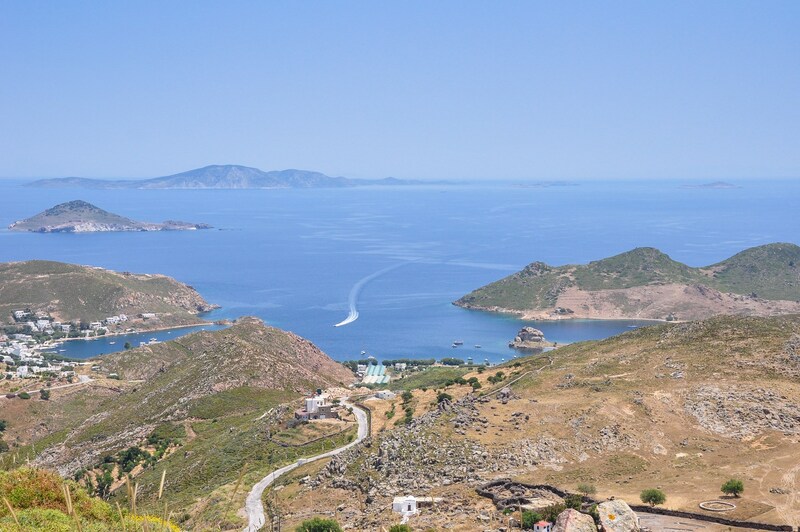 Patmos — A Temple to Aphrodite? Rev. 1:9 I, John, your brother and companion in the suffering and kingdom and patient endurance that are ours in Jesus, was on the island of Patmos because of the word of God and the testimony of Jesus. 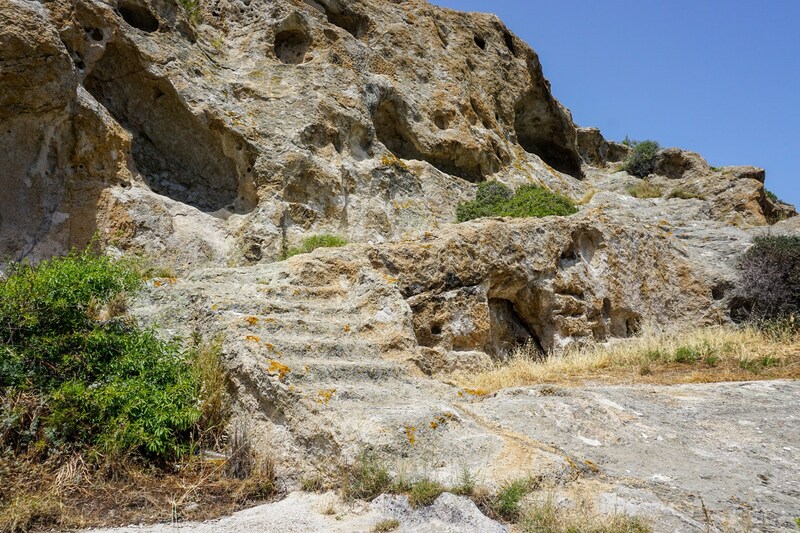 Although many think that Patmos was a barren Alcatraz-like island where John was exiled, this is not true. First-century Patmos, with its natural protective harbor . . . [was] a large administrative center, [with] outlying villages, a hippodrome (for horse racing), and at least three pagan temples made Patmos hardly an isolated and desolate place! It has been suggested that one of the those temples, the one dedicated to Aphrodite, was located on the Kalikatous Rock that is located in the Grikos Bay. View looking east at the area of Grikos Bay. Click on Image to Enlarge and/or Download. View looking east at the area of Grikos Bay—the boat is entering the bay. On the right (south) side of the bay is the Kalikatous Rock (see below). In the distance are the islands east of Patmos. This bay has been officially included in the 2011 catalogue of “the most beautiful bays in the world” by the UNESCO Foundation. View looking south at the Kalikatsou Rock. 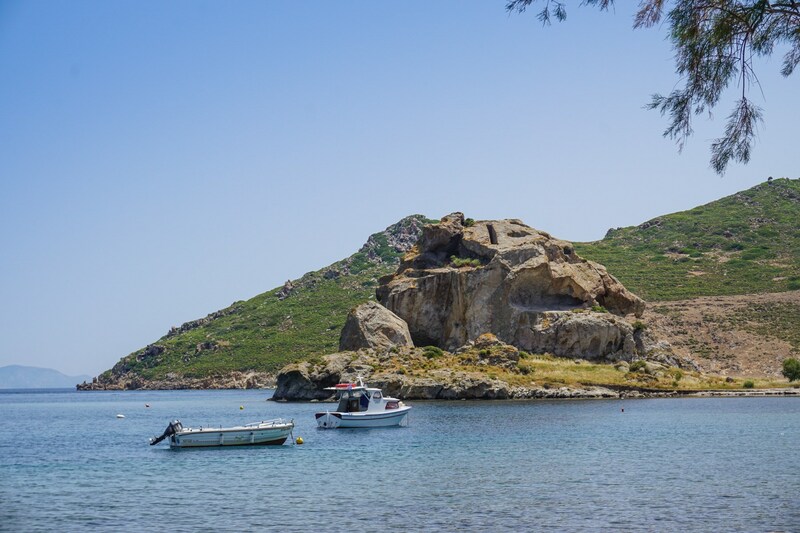 Historical sources indicate that a Temple of Aphrodite was located on the Island of Patmos and many believe that the Temple to Aphrodite was located here but no excavations have taken place. Note the carvings on the rock. View looking south at carvings and stains in the Kalikatsou Rock that may have been part of the Temple of Aphrodite that was located here. Note the rock-cut stairs and the carvings to the right of the stairs. 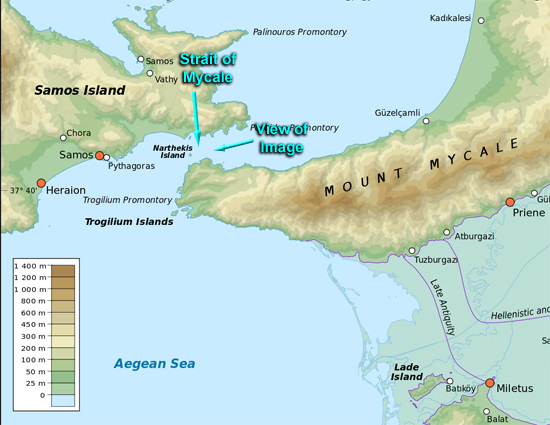 Thus it is very possible that the island where John was exiled (Revelation 1:9) was “populated” with not only a citadel and a temple dedicated to Aphrodite, but also with temples dedicated to Artemis (possibly where the Monastery of Saint John is located) and Apollo (possibly near the modern harbor). For these suggestions and references please see Gordon Franz’s article cited below. To view additional images of the Kalikatsou Roack and the Bay of Grikos on Patmos Click Here. For a helpful article describing the Patmos that John was exiled to, see Gordon Franz, “The King and I (Part 2).” Bible and Spade 12 (2000): 115–23. It is also available on Gordon Franz’s website Life and Land but without graphics. 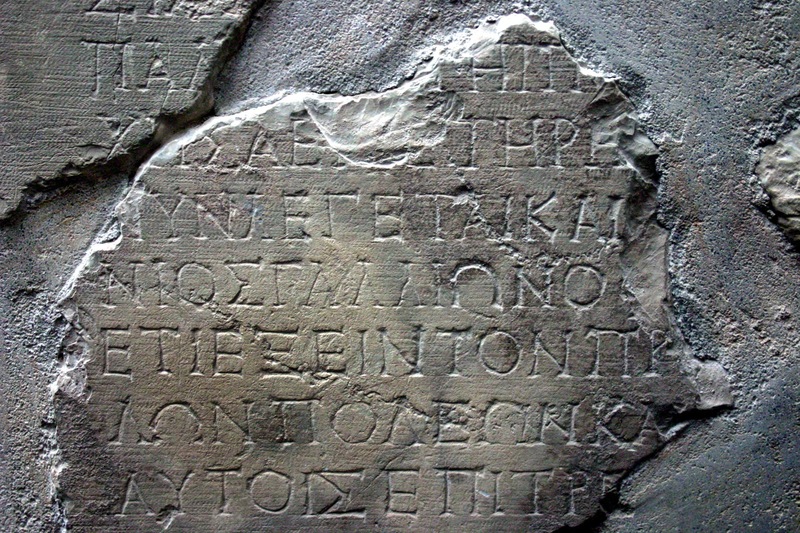 The moral problems among the “saints” of the church of Corinth are well-known. Writing of days prior to Paul, Strabo said that the Temple of Aphrodite owned one thousand temple–slaves and prostitutes! Thus the reputation of Corinth was well–known. It is not probable that interested persons would climb 1700 feet to the temple of Aphrodite (the goddess of love) to visit a prostitute, but her temple was located there. 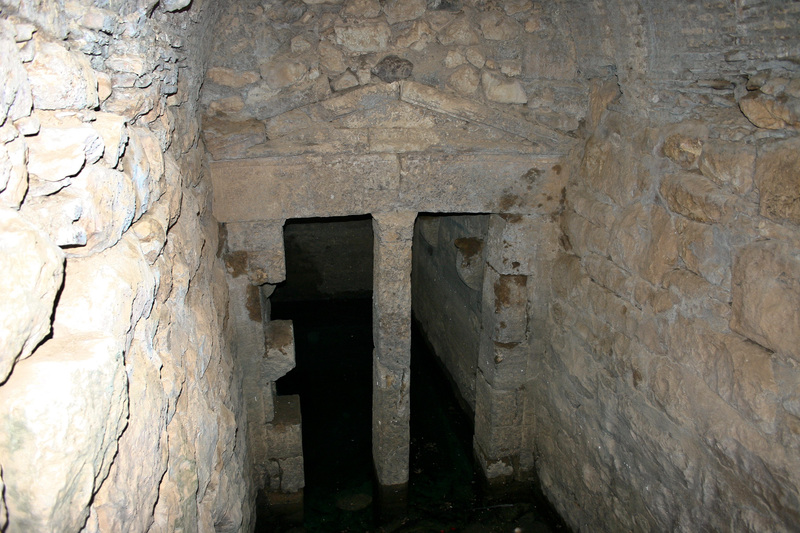 Besides the several springs (Peirene Fountain, Glauke Fountain, Lerna Spring by the Asclepion) that were located near the site of Corinth itself, there actually was a powerful, not too frequently visited, spring on the top of the Acrocorinth call the “Upper Peirene Spring.” The basic remains visible in the image above date to the Hellenistic Period (third to first century BC). For additional views of the remains of the Temple of Aphrodite Click Here. For additional views of the Upper Peirene Spring Click Here. Patmos is a Greek island in the Dodecanese group, located about 40 mi. [65 km.] west of the western coast of Turkey. It was here that John was exiled received the revelation that he wrote about in the New Testament book of Revelation (Rev 1:9). Tradition maintains that he was exiled to Patmos during the reign of the Roman Emperor Domitian (A.D. 81–96). He was eventually released and returned to Ephesus—located about 60 mi. [100 km.] 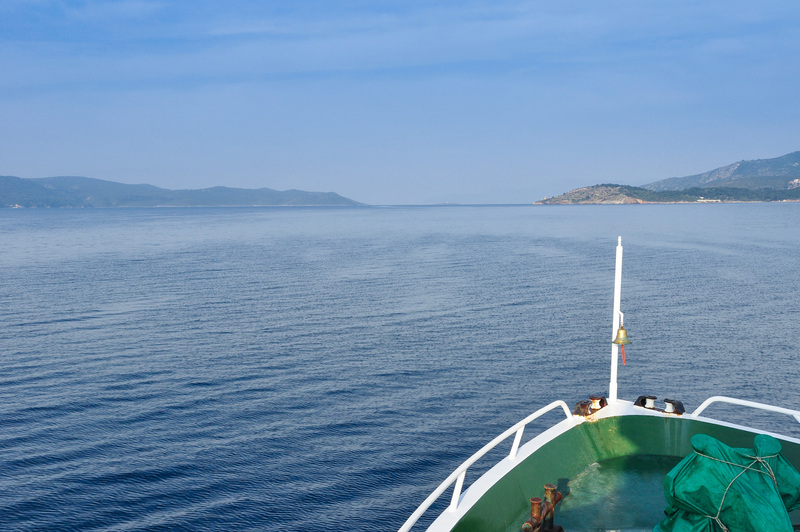 to the northeast of Patmos. View looking north at the Island of Patmos from Mt. Saint Elijah—the highest point on the Island of Patmos (2,900 ft.). The Monastery of Saint John the Theologian and the village of Chora are in the center of the image. Double Click on Image to View and/or Download the full size Panorama. 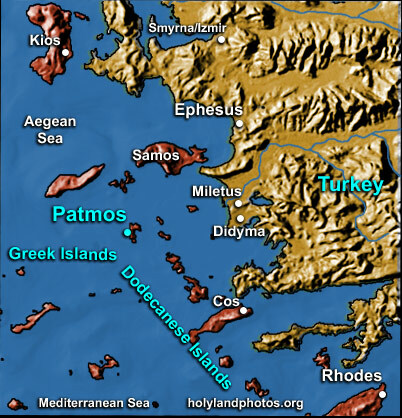 Notice that the island is not very wide and visible on both the right (east) and left (west) side of the image a variety of near-by islands are visible—providing a “geographical context” for the Island of Patmos. Patmos is shaped somewhat like the letter “C”—open to the east. It is composed of three parts connected by two isthmuses. The larger northern part is connected to the central (main) part by a narrow isthmus. The island is about 7 mi. [11 km.] long, and up to 3 mi. [5 km.] wide. It is 13 sq. mi. [34 sq. 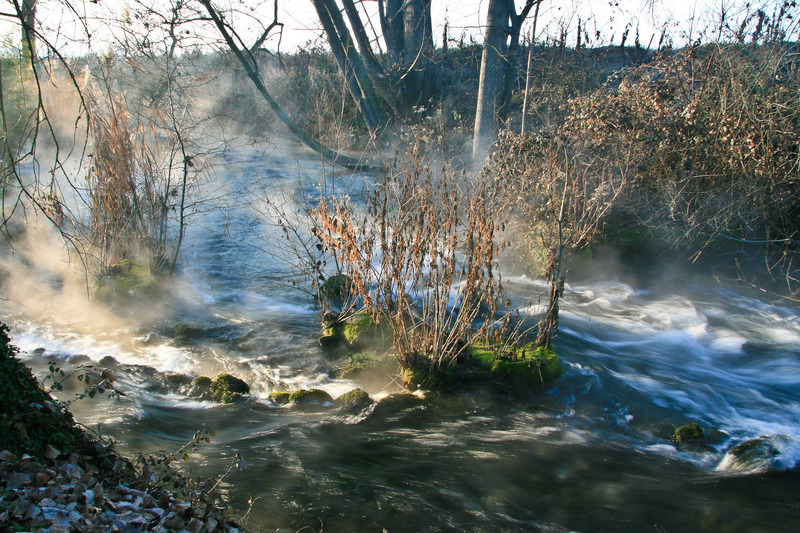 km] in area and has a population of about 2,750 persons. 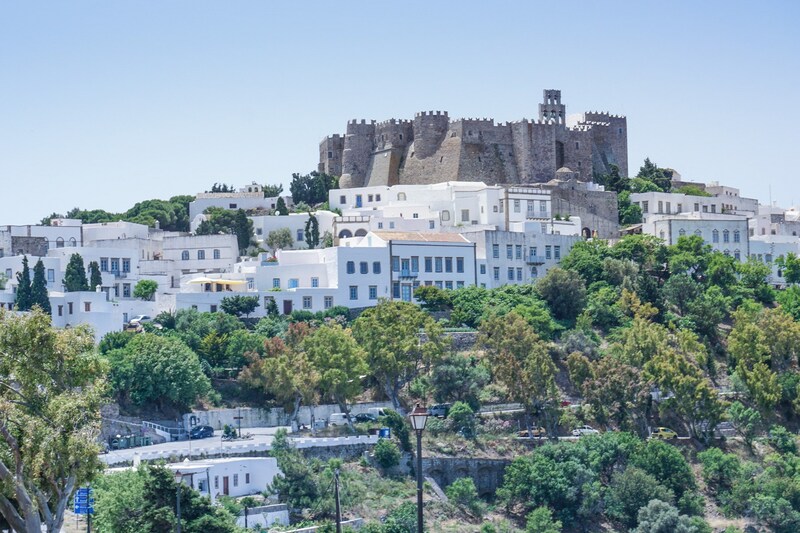 The most famous structure on the Island of Patmos is the Monastery of St. John the Theologian. It was built in A.D. 1091 by the “Holy” Christodoulos who had received permission from the Byzantine Emperor Alexis I to build it. 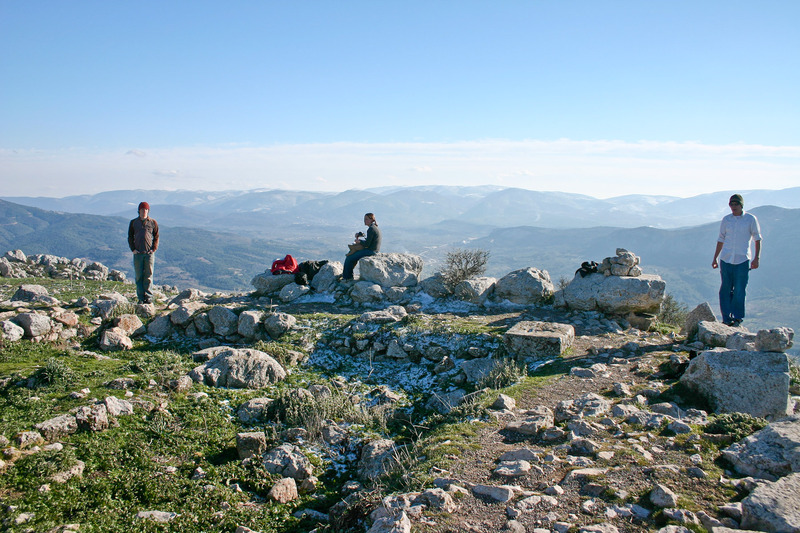 This fortress–like monastery is situated on a prominent hill about 1.5 mi. [2.4 km.] inland from the port of Skala at an elevation of about 790 ft. [240 m.]. This is one of two places that “day visitors” visit during their brief stop at Patmos. 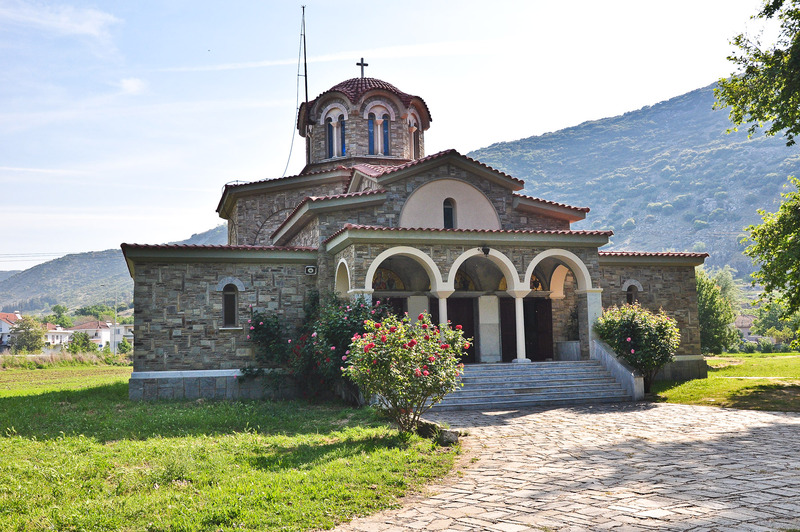 Click Here to view 13additional images of the Monastery of St. John the Theologian. This past May we had the opportunity to explore some of the remote portions of the island and I will be sharing some pictures from that visit in future posts.